BIG KIZZ is a brand new project featuring Pontus Westman (LADY BANANA), Axel Sjöberg (ex-GRAVEYARD), and John Hoyles (SPIDERS, ex-WITCHCRAFT). The release of their brand-new debut EP, “Eye On You”, is a Classic Rock and Roll jammer that is meant to get people dancing and having a good time. Does it ultimately have its issues in terms of originality and execution? Absolutely. But, it does serve its purpose of putting up catchy rock anthems that grab the ear quickly. The EP kicks off with title track, “Eye On You”, which is about as Classic/Old School rock and roll as any band is going to get in 2017; think THE KNACK/“My Sharona”. This is definitely going to be a hit or miss situation for most people depending on personal taste. If you enjoy Rock and Roll, which I have been known to, the song is catchy, well written, fast moving, and their performance is emotionally driven. However, the issue is it will likely only grab fans that can specifically relate to this style. The basic nature of the EP, only having 3 instruments (for the most part), and the 80’s production value/recording quality, will likely fail to resonate with any fans that aren’t naturally interested in this sound, as it is not necessarily forward thinking in 2017. This is not to say it isn’t good, it absolutely is; you just have to know what you’re getting. The second track, “Baby Boy”, is a short song that comes in at just over 2 ½ minutes. However, it wastes no time and proves to be another quick toe tapping song that is simply pure fun to listen to. The writing in “Baby Boy”, in particular, is reminiscent of older rock and roll bands (I mentioned THE KNACK earlier) but they do this without being derivative or unimaginative, it’s both original and paying homage to Classic Rock all at once. That is NOT easy to do, and BIG KIZZ should be commended for that. The sound is crisp, the melody is awesome, and the lyrical content would be a blast at a live show. I can just imagine 80 people in a small rock venue all dancing in the pit screaming the chorus lyrics “I DON’T WANT IT, I DON’T NEED IT”. The final track, “White Faces”, is a classic album closer; quick and driven by low riffs that fits the rest of the EP’s style but keeps it fresh and non-repetitive. This is another shorter track coming in at 2:18, but it works for the band’s style. Overall the band’s performance of the EP is quite good. Assuming you are into the style, it’s well written, the performance is technically proficient, and Westman’s vocals are AWESOME. I can’t remember the last time I had the urge to sing along to a rock and roll band the way I did listening to “Baby Boy”, and that is all credited to his bright tonal quality, correct delivery of pitches, and the way he shouts and sings the vocals simultaneously. 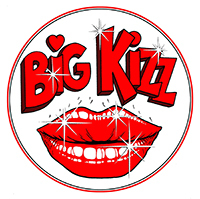 There’s lots of fun to be had listening to BIG KIZZ debut effort.